Password is our key to enter online world. Every online account needs password. So we must be very careful when choosing a password which is not easy to crack by hackers. There are many ways to crack password like brute force attack etc. Previously we have shared how to create a secure password. Today I’m going to tell about a great online password strength checker – how secure my password. 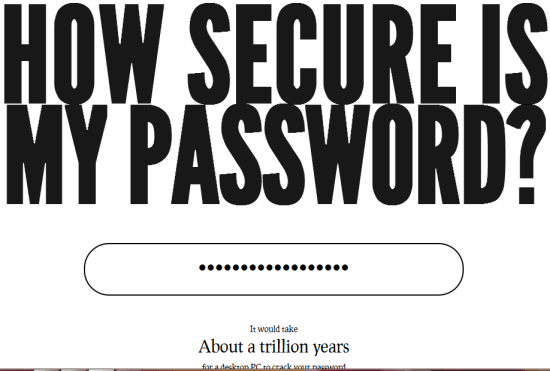 Using this website you can check how secure your password is. Visit this website and enter your password and it will instantly show you how much time a desktop PC needs to crack your password. It calculates strength of password using mathematical calculations and according to the website it shows accurate results.Before choosing a password you should check strength of password using this. But I have a question… Since we are providing our password to this site, won’t it be visible to them??? So is it safe enough to share our password with them???? 😛 Great tool indeed to check how secure your password is. I too was worried if my password would be logged. I got more worried after finding the link dead!